What fees are associated with the CRUISE Americard? We do not charge any account maintenance fees, annual fees, account set up fees, cancellation fees, etc. The absence of fees will save you and your company hundreds of dollars annually. How will the CRUISE Americard fleet gas cards be advantageous to my company in terms of price? Don’t commit to one brand or a small network as it obligates you to their pricing, and no matter what they try to tell you, their price will fluctuate. Choose the best price each day by using a fleet fuel card that is truly accepted nationwide. Having the freedom to shop price in a market that fluctuates daily will add up to savings. How will the CRUISE Americard help me save money? Wasted dollars of payroll and fuel can add up quickly driving to and from fueling locations with smaller or limited networks. Our nationwide acceptance will allow you to keep those dollars. Does the fleet fuel card offer wholesale pricing? Those who offer wholesale pricing in the fleet fuel card business want you to believe that their product and service cost is less than retail. The problem is that their customers often pay more than retail. This can be attributed to several factors including hidden pricing at the time of fueling, their fees and a limited network. You may not qualify for their discount as they are often made intentionally difficult or unattainable. Our discounts work as advertised and without fees or mark up to compensate for them. 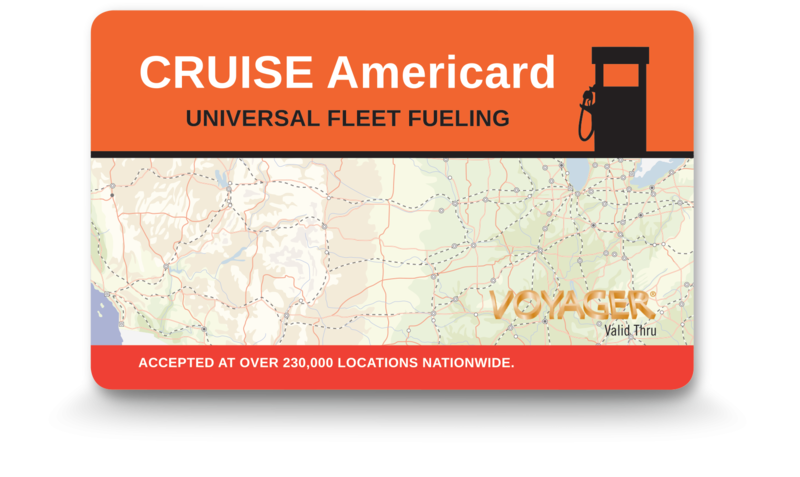 Are there any obligations with the CRUISE Americard fleet fuel cards? No! With our proven product, over 70 years of experience, no hidden fees and no cost to begin or end service, you have nothing to lose and everything to gain! This includes the 10 cents off every gallon incentive during your first two months. What type of management tools does the CRUISE Americard offer? We offer customizable controls and services that are designed to save additional dollars by eliminating unwanted purchasing. To list one commonly used feature, save time and money as employees no longer need to keep receipts or make reports. Reports with receipt details are available 24/7 via email, internet or phone. We can also set up alerts to be emailed or texted to you or your fleet manager in real time. If you need assistance with your fleet gas cards, we have a great support team! We offer a personal touch during regular business hours with an individual assigned to each account for drivers and management. We also offer 365 days a year of 24/7 availability with US based customer service representatives waiting to help. Nothing. Yes, that’s right! No fees, no mark-ups, and no start-up costs. How can we trust that your fleet fuel card really is the best? The proof is always in the pudding as they say. We offer no cost to begin or end service and incentive to get started. Upgrade today! How do your fleet fuel cards pay out the promotional 10 cents per gallon? We will send you a check or apply the credit to your invoice. It’s up to you.